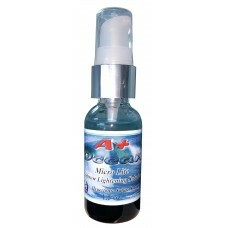 A+ Ocean Hypertonic Saline is a natural and safe process used for lightening or removal of cosmetic eyebrow tattoos. The technique uses the scientific principles of osmosis and equalization. The hypertonic saline solution is inserted using permanent makeup or tattoo techniques over the unwanted pigment. It is the body’s natural healing process that removes or lightens the pigment. Unwanted pigment will start to disappear. Several treatments may be necessary just as most removal treatments require. 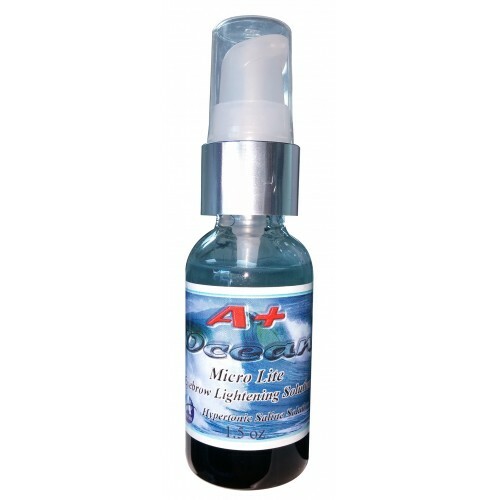 A+ Ocean Micro-Lite Eyebrow Lightening Solution Removal – Hypertonic Saline is the first concentrated hypertonic saline solution on the market. It uses the finest quality sea salt available. The salt is refined with a complete filtering process that makes the product as pure as can possibly be manufactured. You will not find any carcinogens or other products used in the formulation that other saline products contain or that have FDA warnings. There are no big clumps of salt on the bottom of the bottle and the aloe is preserved to give you the very best stability. A+ Ocean Micro-Lite Eyebrow Lightening Solution Removal is for trained and licensed professionals only. Results may vary depending on the equipment, needles or technique used. You will find that if you follow the manufacturer’s recommendations, excellent results can be obtained to either remove or lighten conventional/cosmetic tattoos. It can also be used to substantially perform corrective work. Most cosmetic/conventional tattoo insurance companies will insure the all-natural removal and lightening procedures. It’s recommended to use a cosmetic or conventional machine using round shader configurations and an oval technique. The needle should not be inserted any more than 1.5mm into the tissue, a tattoo normally penetrates the skin at approximately 2mm. No more than four passes should be made on areas no larger than 1″ x 1″ or one set of eyebrows Procedures can be performed 30 days apart for best results. Skin condition and the depth of the tattoo are determining factors on the removal process.